There wasn’t a whole lot planned for Thursday so us early arrivals were let loose on the city until the pub opened and the others arrived, before we spent the night at a conveniently located scout hall, from which we were dispatched to expeditions on Friday. I’ll talk more about my expo after some fact-checking, but we spent a lot of time driving between waterfalls through canefields on roads which more often than not were criss-crossed by rail lines, because they don’t believe in transporting by truck for some reason, so they just leave about half a dozen trucks at each farm. 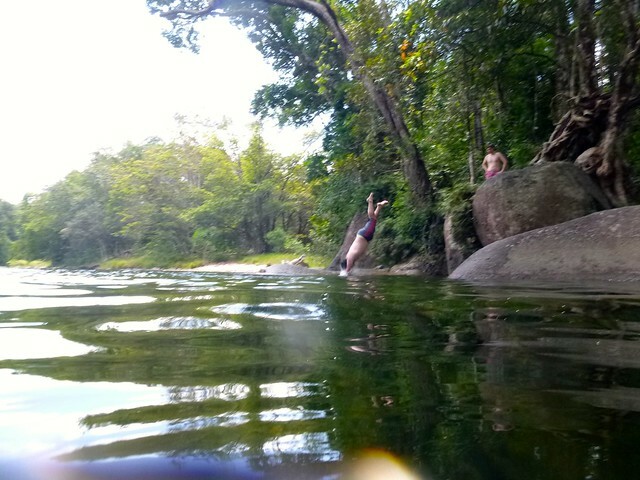 We spent our day swimming in pristine pools, generally fully of smooth smooth rocks, jumping, splashing, watersliding and mucking around, interspaced by “city and surrounds tour stops” before we stopped for a fantastic lunch overlooking the browned, hilly farmlands. 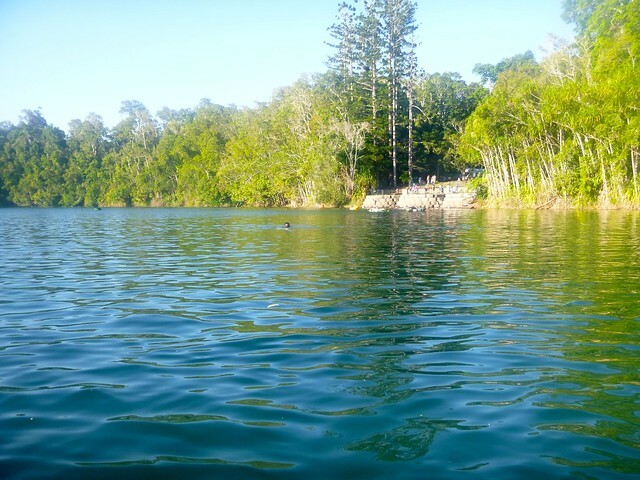 After that it was time for a quick swim in the deepest lake in mainland Australia, followed by a ride back down into Cairns to get on a different bus and head back up onto the tablelands; to Barabadeen where the real action was. First up was cane toad racing, at which I failed miserably due to never having seen on of the little monsters before, although I did eventually catch the blighter. The other Friday night game was Alpine Rovering favourite “circumnavigate the table” although the table was a bit less … robust than the tables at Baw Baw and Bogong. 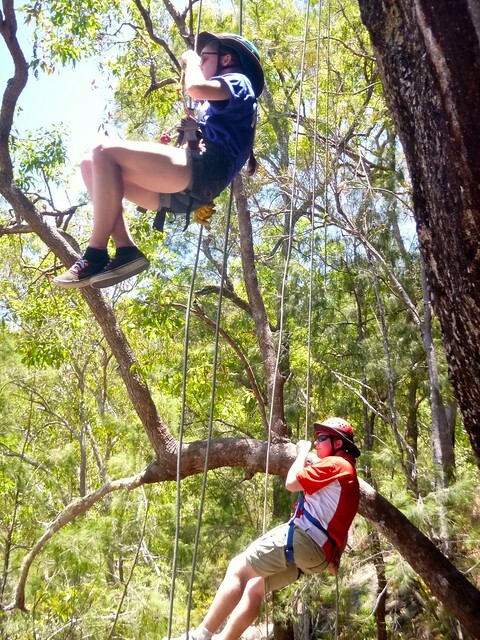 Saturday morning was Service Time, shortly followed by high Ropes, loafing about at high ropes, or abseiling to taste. Unfortunately the abseiling site was half an hour and a couple of ridges away from the drop off point, but we were rewarded with a great view (through the trees) of the river downstream - also my log now has 100 abseils in it, so that’s exciting. After that, Aunty Kirsty, who just so happened to be visiting Far North Region rededicated the newly refreshed Barabadeen Activity Centre so we were rent a crowd for that little endeavour, before heading back to the site proper to spend the afternoon frolicking in the dam. There was sailing and other boating on offer, but the highlight were these floating picnic tables on 44 gallon drums, or more specifically, how no one understood their stability requirements. I have photos. Saturday night featured a medieval feast, to which everyone dressed up - I had two coconuts for my horse “costume” because weight restrictions which I feel somewhat bad about as everyone else put in so much effort. Master Chef Andy really brought his A Game to this meal at which no forks were allowed, as we were eating medievally, although knives were allowed - which I’m reasonably sure is anachronistic. That’s pretty much where my account ends though because that’s when dehydration hit me like a freight train so I retired for the evening, and the early run to the airport had me leaving before most people were out of bed. So thanks to Kamerunga (side note: Cowabunga seems to be an acceptable pronunciation, which is a crew I would have had zero hesitation joining) for having me along, organising transfers and generally being awesome, and the other QLD Rovers who accepted me with almost zero Mexican jokes. All in all, I have absolutely zero hesitation in recommending that any Rover anywhere who has the chance to go to the next Cairns Moot grab that chance with both hands and use it to bludgeon anyone who attempts to take that chance away from you. Just make sure that you drink enough water. Have a look at my Flickr album for a whole lot more pictures of the weekend, and click below to enjoy the singing skills of my expedition on Friday.